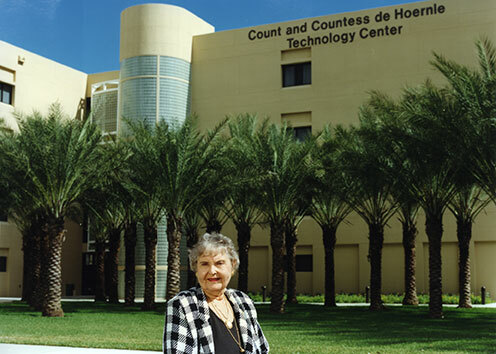 Countess Henrietta de Hoernle stands on the Lake Worth campus in front of one of four buildings named in her honor at Palm Beach State. As family and friends prepare to memorialize Countess Henrietta de Hoernle Aug. 6, Palm Beach State College also is remembering the noted philanthropist for her generosity. De Hoernle, who has four buildings and an endowed scholarship at PBSC named in her honor, died in hospice care in Boca Raton July 22. She was 103. According to her obituary, de Hoernle was born in the German Black Forest town of Karlsruhe to musician parents and came to America in 1931 to live with her grandparents in the Jackson Heights neighborhood of Queens in New York. Twice widowed, she met businessman and engineer, Adolf, the Count de Hoernle in 1950. Together, they spent the next decades transforming the communities in which they lived by their generosity and humanitarian spirit. Those communities included Palm Beach County, where they contributed their time and resources to hospitals, colleges and universities, soup kitchens and historical points of interest. After Adolf died in 1993, Henrietta de Hoernle continued her philanthropic work. Click here to read the complete obituary and funeral details.